at 718-821-1750. Please allow eight to ten weeks for receipt of information. This Beautifully restored Family Mausoleum is just a small part of the family history of the current Chairman, President & CEO of the All Faiths Cemetery. 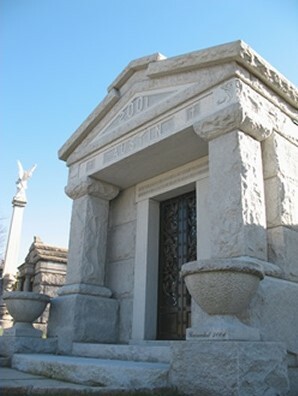 This elegant structure holds the remains of the Cemetery Presidents’ mother, Emma and father, Robert. The President also has 18 additional family members interred at the All Faiths Cemetery dating back to the late 1800’s and from the Ridgewood, Glendale, Maspeth and Middle Village areas.